JOIN THE INTERIOR DESIGN REVOLUTION WITH MY THREE SIGNATURE PACKAGES, PERFECT FOR WHATEVER PROJECT YOU HAVE IN MIND! Perfect if you’ve got all the furniture but need those finishing touches to give your space some personality! A one-hour, post-delivery conference call so I can answer any questions you may have. Perfect if you’ve got a blank slate, and are most concerned with getting new furniture in place! An itemized floor plan that includes any furniture you plan on keeping and all of your new pieces so you know where everything goes. Perfect if you’re working with a pretty blank slate and want furniture and all the finishing accessories! NOT SURE WHICH PACKAGE IS BEST FOR YOU? SCHEDULE A CONSULTATION SESSION WITH ME, AND WE’LL GET YOU STARTED WITH JUST THE RIGHT SERVICE FOR YOU! WANT TO LEARN MORE ABOUT THE VIRTUAL INTERIOR DESIGN PROCESS? Stephanie was a dream to work with! She immediately understood my vision (and my budget limitations) and was even able to elaborate on my concept even more. I wanted a sophisticated library feel for my son's 10 year old bedroom, and she was able to marry my vision with the fact that my son is 10 and the room should still reflect his youth. She was responsive, worked quickly to find alternatives to suit our room (and my son's interests), and the end result is a fabulous, beautifully decorated, sophisticated yet accessible, fun room. He loves it and I love it too! I couldn't have asked for better work if Stephanie was sitting right there in front of me. Stephanie is amazing!! I loved working with her to create the space I’ve always wanted. Stephanie really took the time to make sure I was happy with every little detail. She never made me feel like I was troubling her to find just the right piece for me. Stephanie worked closely with me to find my style and what I like. She is so talented, creative, and I love her style! Stephanie did an amazing job with our room! She helped us put the vision we had for our space into action and suggested pieces we never would have found or thought of on our own. The end result is a gorgeous, comfortable room that everyone comments on as soon as they walk in our door! Stephanie has an eye for detail!! We were worried initially that working remotely with a designer might not work for the amount of detailed instruction we needed (my husband has quite a bit of audio equipment, cords, speakers, instruments, etc.). She was also able to get a feel very quickly for the style we were wanting for my husband's home studio. Stephanie was able to tell us EXACTLY where everything should be placed for optimal organization and visual aesthetic. This was a bit of a specialized room and we are so grateful to work with such an outstanding professional. She delivered in spades. Working with Stephanie was amazing!!! She is as intuitive as she is creative, and I really loved that she was so willing to work around my (limited) budget. The only way I could improve on the experience would be to have her here in person. 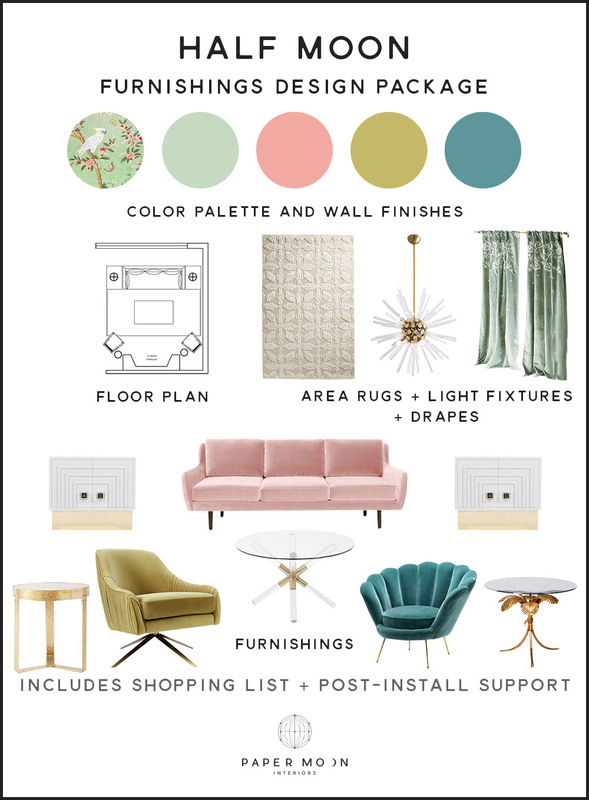 So let's get started creating the glamorously whimsical interior you've always wanted so you can stop stressing over your home and start enjoying it!